For the most part, I’ve tried to keep a positive attitude about tandem nursing, because I do think it’s a nice and important thing that I’m doing for my boys. But sometimes, I just need to vent about how very hard it is! Since I was pregnant, I’ve started feeling bothered by nursing my toddler. The whole thing is often overwhelming to me, from his verbally pleading for milk to the way he wants to rub my face while he nurses. I know I should be thankful he’s not trying to rub my other breast while he nurses, but there is just something about the way he has been stroking my face with his dirty hand that freaks me out. Rationally, I understand that his world has been turned upside-down by getting a baby brother and he wants to know he can always come to me for comfort and all of those things. But realistically, my very-verbal 2.5 year old is spending hours each day pleading to nurse and, since I allow him one nursing session per day, he frantically gulps as much as he can when it’s his turn with Mama. I’ve always told myself I’ll take this process one day at a time, and some days I just don’t let him nurse. If my newborn is going through a growth spurt or has been cluster feeding, I feel totally touched out and just don’t let my toddler nurse at all. Sometimes, I try offering other things as a distraction. My husband asked my toddler if he’d prefer a milkshake or perhaps some chocolate milk, but he loudly declared that “milkies” taste better than any of those other treats. I hear tell that kids undergo a shift as they hit their half-birthday. We are just a few weeks away from my son being 2.5, so today, I’m hoping for a shift. Maybe he’ll feel too independent to want to nurse beyond that, but at the very least I’m hoping the experience feels less…intense. Today I’ve said no to each request. Tomorrow I might feel better about it. 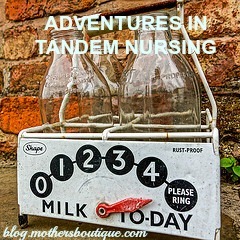 Have you tandem nursed your children? Leave us a comment to share how you handled frustration!